Amazon.com description: Product Description: Rousseau and Dignity: Art Serving Humanity is a richly illustrated volume relating a series of eventsâa photography exhibit, lectures, commentary, and audience reactions by people ages seven to ninety-twoâheld in the name of Jean-Jacques Rousseauâs tercentennial in 2012. Drawn together by the unexpected convergence of a lecture series and art exhibit held in South Bend, Indiana, and a documentary film that was shot simultaneously in CompiÃ¨gne, France, the participants had several goals: to show why Rousseauâs moral philosophy is important for our time; to argue for the importance of subjective art forms such as photography, video letters, and autobiography; to reproduce the stunning photojournalism commissioned by Amnesty International to document and dignify people who suffer human rights abuses, such as substandard housing, nationless-ness, and ethnic prejudice; and to inspire new kinds of intergenerational teaching. The book includes essays from world-renowned scholars on Jean-Jacques Rousseau; five chapters by photojournalists, which include fifty-four photographs from Egypt, India, Macedonia, Mexico, and Nigeria; and notes by youthful visitors to the exhibit. In the volumeâs unorthodox combination of art and text, creation and reflection, the authors hope to elicit readersâ interest in, and commitment to, an engaged form of public humanities. 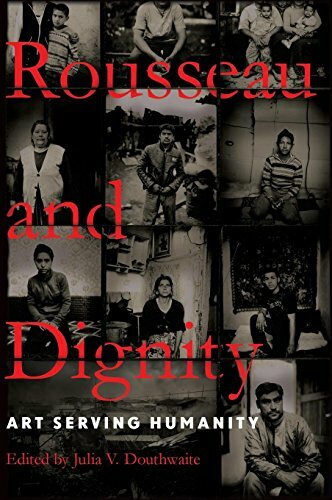 About: Rousseau and Dignity: Art Serving Humanity is a richly illustrated volume relating a series of events―a photography exhibit, lectures, commentary, and audience reactions by people ages seven to ninety-two―held in the name of Jean-Jacques Rousseau’s tercentennial in 2012.